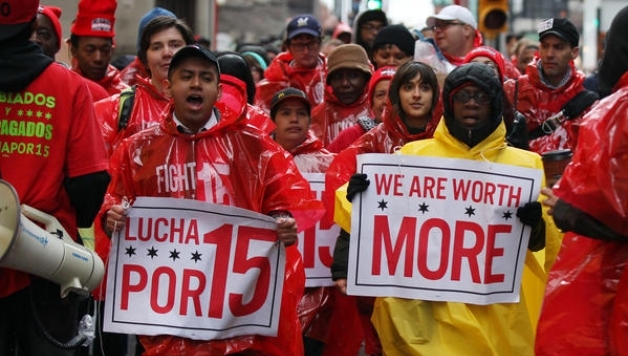 The fight for a $15 an hour minimum wage is gaining further momentum. On April 1, Seattle´s low-wage workers will see the first rise thanks to the efforts of workers, labor, and 15 Now. Seattle is the first major city to implement a $15 an hour minimum wage, phased in over the next few years. Ultimately, 100,000 workers will be lifted up, one in four employees in the Emerald City. On April 1, all workers in big businesses like McDonald’s, Starbucks, Macy’s, and Target will see an immediate increase to a minimum of $11 an hour, and by 2025 all workers in Seattle will be making at least $18 an hour. It is estimated that this will result in businesses paying $3 billion in increased wages for the lowest-paid workers over the next 10 years. People of color and women will benefit in particular, given their over-representation in the ranks of the lowest-paid. The movement, started by fast-food workers in New York City at the end of 2012, has won a major victory. The success in Seattle last June opened the floodgates nationally, inspiring further victories. Even stronger legislation for $15 in San Francisco followed, and the midterm election saw successful ballot initiatives to raise wages, even in Republican-dominated states like Alaska and Arkansas. The possibilities for a major victory in Seattle became clear in November 2013. A ballot initiative for $15, heavily backed by a coalition of labor unions, passed in SeaTac, the small city housing Seattle and Tacoma’s international airport. At the same time, the first openly socialist candidate in a century won a seat on Seattle’s city council with almost 100,000 votes against a 16-year Democratic Party incumbent. Socialist Alternative’s Kshama Sawant won on a platform calling for $15, as part of a program to make Seattle affordable for all. The importance of this victory became clear as Kshama Sawant took immediate action. She launched 15 Now in January, 2014 to offer an organizing tool for all activists and to give full democratic ownership of the campaign to workers getting involved. From the start, 15 Now built neighborhood and campus action groups to activate as many people as possible. March 15 saw an energetic march for $15. A national conference brought hundreds together on April 26. 15 Now prepared a ballot initiative, a “charter amendment,” to immediately increase the pressure on the city council and as a backup plan if they didn’t deliver. There were constant mobilizations, tables in all parts of the city to convince people, teach-ins, conferences, posters, and major marches for $15 on Martin Luther King Day in January and on May Day. These endless efforts were necessary to win solid support in Seattle against the anti-worker propaganda of big business and the mass media. However, throughout the fight for $15 in Seattle, there was an ongoing debate within the movement on its strategy. David Rolf, president of SEIU 775, explained the thinking which guided the main union leaders. In an interview, he said that it was necessary to have a “left flank” and that he had “nothing but respect for Sawant and her organization, 15 Now … But we don’t agree on the strategy. For some period of time, we’ve made it clear we support the concept of a phase-in, we want to reach a compromise and we believe the best compromise is one with labor and business at the same table joining their hands and advocating to the council” (KPLU.org, 5/1/2014). But as the president of the Seattle chapter of the National Restaurant Association, Bob Donegan, said, business only accepted the mayor´s proposal – the basis for the legislation in the end – as the “least offensive of the imperfect solutions.” He explained, “If Seattle must go to $15 – and that appears a political reality – there are elements to like in this deal” (Seattle Times, 5/3/2014). This underlines the reality that it was only due to the widespread public support won by Kshama Sawant, 15 Now, and the labor movement that business was forced to accommodate itself to the new political reality of a $15 minimum wage. Even Seattle Mayor Ed Murray admits in retrospect, “If we hadn’t negotiated the proposal that we negotiated, I believe we would have had mini-class warfare, with competing measures on the ballot … And I believe that `15 Now´ had the potential of passing … So we’ve tried to tailor it toward different sectors of the business community” (Puget Sound Business Journal, 1/2/2015). The agenda of business was clear: If they couldn’t stop a $15 minimum wage, they would try to at least water it down by any means possible. What we won was a result of the strength of the movement built by Kshama Sawant, Socialist Alternative, and the labor movement, and the weaknesses in the Seattle legislation were a result of the counterefforts of business and the support they received from the Democratic Party mayor and city council majority. “Our victory is not complete, but we have fought until the last day, the last hour, against all the loopholes demanded by business … We’ll come back to the questions of tip penalty, the long phase-in, the training wage,” Kshama Sawant said in her speech before voting in favor of the new minimum wage. “What was lost through corporate loopholes is a reminder to us … that we need to continue to build an even more powerful movement … But today’s message is clear: If we organize as workers, with a socialist strategy, we can tackle the chasm of income inequality and social injustice. $15 in Seattle is just a beginning. We have an entire world to win,” (15Now.org, 06/03/2014). In many ways, the fight for $15 resembles the early struggles of the workers´ movement 100 years ago around the demand for an eight-hour day. The task of rebuilding labor and a powerful socialist movement lies ahead. The victory for $15 in Seattle will be remembered as a turning point in beginning this historic task. We have to clarify how $15 was won. It wasn’t handed to us by the Chamber of Commerce. In fact, there was a real push-back by big business, hiding behind small businesses. Without an organized movement, we would not be where we are today.